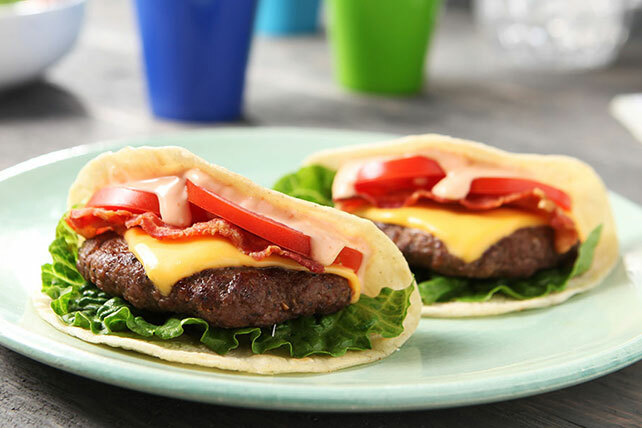 Breathe some life into your menu with our Bacon Cheeseburger Tacos. Bacon Cheeseburger Tacos are a fun combination of two of your family's favorite foods! Combine mayo and Sriracha sauce. Refrigerate until ready to use. Mix ground beef and Dry Rub just until blended. Shape into 6 (1/4-inch-thick) patties. Cook patties in large skillet on medium heat 4 to 5 min. on each side or until done (160ºF), topping with Singles for the last 2 min. Cut cheeseburgers in half; place on tortillas. Top with bacon, tomatoes, lettuce and mayo mixture; fold in half. The built-in portion control you get with each hand-held taco helps you keep tabs on what you are eating. For a milder sauce, substitute HEINZ Tomato Ketchup for Sriracha sauce. Always be sure to cook ground beef until no pink color remains and internal temperature reaches 160ºF.